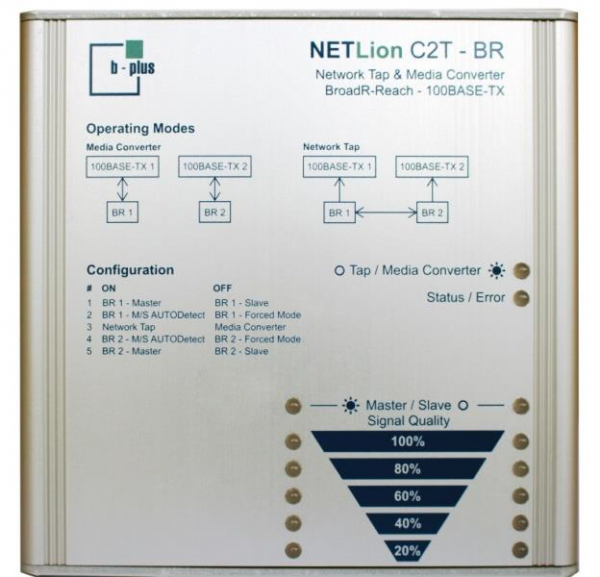 Product information "b-plus B18000-NEL-001-0001 - NETLion C2T - BR"
With the NETLion Configurator Software you can see signal quality, occurring errors, as well as the status of the data traffic. Additionally NETLion includes a filter for ADTF (Automotive Data and Time-Triggered Framework), where you can acquire and view the diagnosis data. NETLion has a Configuration Ethernet Port where you can get this data. Related links to "b-plus B18000-NEL-001-0001 - NETLion C2T - BR"
Customer evaluation for "b-plus B18000-NEL-001-0001 - NETLion C2T - BR"